The Amish Modular Entertainment Center packs lots of storage into its cabinets while it shows off gorgeous solid wood style. This entertainment center is a centerpiece, an eye-catcher and a solution to keeping your living room looking spectacular. The Modular Entertainment Center is available in three sizes to best fit your space. It features raised panel doors, CD and DVD storage, and adjustable shelving all custom made in your choice of wood and finish. 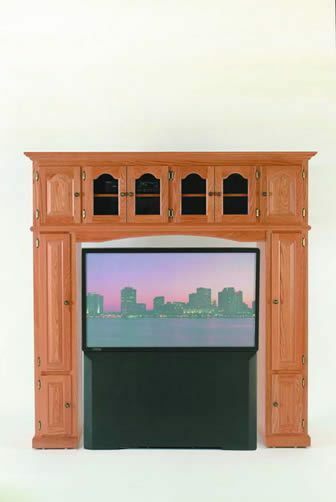 Custom options allow you to have it built with the features best for your living room. You can order samples to find the perfect wood and finish for your living room or family room. Our Amish woodworkers do the rest, building your custom furniture from scratch. We have a team of Furniture Specialists that can answer any of your questions. Email or call us today. Note Bookcases and Rollaway sold Separately. Call for Custom Sizes.